Get in touch with the culture and history of the Philippines on this tour of the Villa Escudero from Manila. 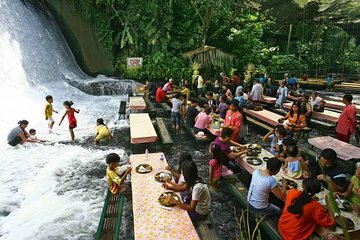 Visit a museum to see the country's largest collection of private antiquities, paddle a bamboo raft down the river, take a carabao cart ride, and eat lunch by a roaring waterfall. This tour also includes exclusive access to the villa's pool and round-trip transportation from Manila and Makati hotels. With a toddler with us, the access to the pool was a definite bonus. Lunch by the waterfall is a definite experience, and the spectacle with music and traditional dances was great too. We would definitely recommend it.